From odd promotions to funky jerseys to everything in between, Minor League Baseball has always been a space for the wild and wonderful. But in recent years there's been an even more offbeat trend going on down there: new, unusual team names. We now have the Baby Cakes, the Rumble Ponies, the Fire Frogs and that's just the beginning. 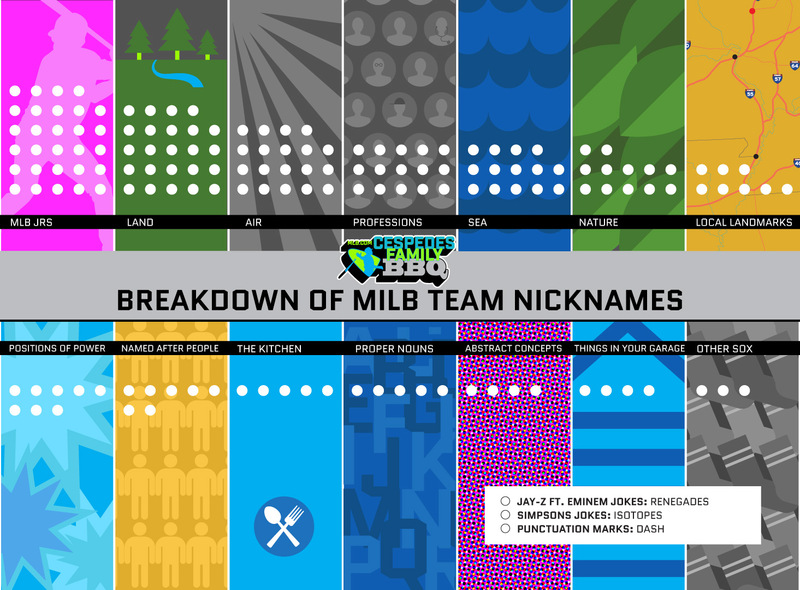 These outrageous and awesome names got us thinking: What's the taxonomical breakdown of MiLB team names? So, we went through all 160 teams and broke them up into 17 categories. The most classic group we compiled was definitely the MiLB teams that are just named after their big league affiliate. The Braves and Cardinals lead the way with three MiLB namesakes each. The largest of the animal-related groups, "Land" is heavy on compound word names like Sacramento River Cats, Toledo Mud Hens and Hartford Yard Goats. But, this group also has some animal names that are either extinct like the Ogden Raptors or aren't even real animals, looking at you Binghamton Rumble Ponies. The "Air" group features mostly different bird types (Missoula Osprey, Idaho Falls Chukars, Great Lakes Loons), but also the Dayton Dragons, whom you could put in like seven different categories. Most of these are fish or shellfish mascots (Tampa Tarpons, Pensacola Blue Wahoos, Hickory Crawdads, Jacksonville Jumbo Shrimp), but we particularly enjoyed putting the Akron RubberDucks here. Technically they might belong more in the "bathtub" category, but RubberDucks can float in the sea too. A Biloxi Shucker is definitely a profession. As is an Omaha Storm Chaser. Chattanooga Lookouts aren't really a profession anymore with the advent of modern technology, but it still counts. The Quad Cities River Bandits and Bradenton Marauders don't reference particularly upstanding lines of work, but those are professions nonetheless. These range from the extremely intimidating (Rancho Cucamonga Quakes, Trenton Thunder) to the picturesque (Tennessee Smokies, Eugene Emeralds) to the obscure (Wilmington Blue Rocks, Tri-City Dust Devils). Don't mess with these teams, yo. The Charlotte Knights and Birmingham Barons will enforce rigid Middle Ages tribute laws upon you in a jiffy, while the Jackson Generals and Lake County Captains will out-maneuver you on the battlefield or at sea if you don't watch out. Just to name a few: The Augusta GreenJackets are named for The Masters, which also call the city home. The Brooklyn Cyclones get their moniker from a famous rollercoaster of the same name behind their left-field fence. The Altoona Curve are named as such because of a particularly famous railway curve located near Altoona. This is a fun group. Three of these teams -- the Round Rock Express, Aberdeen IronBirds and Auburn Doubledays -- are named after famous baseball figures (Nolan Ryan, Cal Ripken and Abner Doubleday). Two of them -- the Frederick Keys and the Frisco RoughRiders -- are inspired by well-known historical Americans (Francis Scott Key and Teddy Roosevelt). The Kannapolis Intimidators get their name from hometown hero Dale Earnhardt, while the Fort Wayne TinCaps get theirs from a relatively obscure Johnny Appleseed reference. Snack Time! The New Orleans Baby Cakes, Modesto Nuts and Montgomery Biscuits are all perfect tummy-fillers in-between big meals, while the Cedar Rapids Kernels and Hillsboro Hops are fundamental parts of important baseball dietary staples: Popcorn and beer. Important note: the Vancouver Canadians are not made up of all the Canadians who live in Vancouver. Fort Myers Miracle! West Virginia Power! Lexington Legends! Greenville Drive! Good luck finding a pump-up speech anywhere that doesn't feature any of these nebulous team names. Maybe you don't have any Bowling Green Hot Rods in your garage, but you probably have some Corpus Christi Hooks in there at the very least. For whatever reasons, baseball has always loved naming its teams after socks. The Minors keep that bizarre tradition alive with the Bowie Baysox, the Colorado Springs Sky Sox and the Everett AquaSox. Yes the Albuquerque Isotopes are the Isotopes because of The Simpsons. We don't know for sure if Em and Hova were truly the inspiration behind the New York Penn League's Hudson Valley Renegades, but you have to think they played a role. The Winston-Salem Dash are named the Dash because of the dash between the words "Winston" and "Salem," even though that snippet of punctuation is actually a hyphen and not a dash. Minor League Baseball is the best.